By William J. Murray and Robert Armstrong. June, 2015 marks the 800th anniversary of the reluctant signing of the Magna Carta by King John III in England. Yet, we continue to live our lives carelessly, giving no second thought to the freedoms that we enjoy in the United States, except maybe at Memorial Day when we think of the veterans who continue to shed blood for our freedoms. Eight centuries ago, the backbone of our personal freedoms and liberties were established. The Magna Carta established the “rule of law” a principle that is fundamental to Western governments today. Before June 15, 1215, the kings had their way to those who were under them. But pressured by rebellious English barons, King John grudgingly signed the “Great Charter” that gave certain freedoms to the common Englishman. The king could no longer make up the rules of law to suit his whims and wishes. In short, the law was coming up from the people, rather than down from the monarchy. The Magna Carta (Latin for “Great Charter”) was initially drafted by Stephen Langton, the Archbishop of Canterbury in order to make peace between rebel English barons and a very unpopular king, King John. At first, it promised the protection of church rights, protection for the barons from illegal imprisonment by the king, access to swift justice, and limitations on feudal payments to the Crown, to be implemented through a council of 25 barons. This council was later known as “Clause 61”. It was to make sure that King John adhered to the charter. 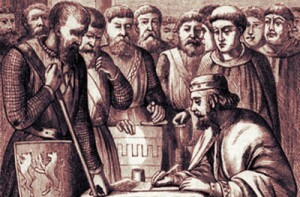 If John did not conform to the charter within 40 days of being notified of a transgression by the council, the 25 barons were empowered by clause 61 to seize King John’s lands and castles until, in their judgement, amends had been made. Initially, the Magna Carta was concerned with protecting the privileges of noblemen from royal encroachment. It took centuries for that foundation to become a document about the rights of individuals, justice, liberty, and democratic government. Even now in our society, as a direct result of the Magna Carta, liberty and democracy are inseparable. In the beginning, it was quite a “hot potato” by today’s standards. It was annulled by Pope Innocent III, then re-issued by King John’s young son, Henry III in a political exchange for new taxes. But his son, Edward I, repeated the exercise in 1297, this time confirming it as part of England’s statute law. Proponents of the Magna Carta contended that the liberty of individual Englishmen made the King subject to the common law of the land. The Magna Carta formed the beginnings of the trial by jury system, and acknowledged the ancient origins of Parliament. Thanks to the Magna Carta, an English monarch was not able to revise these long-standing English customs. Through numerous changes, the Magna Carta, though modified, survived. The charter, which English barons forced King John to accept at Runnymede in 1215, is best celebrated as a symbol of the rule of law rather than a vital legal document like the U.S. Constitution. But the Magna Carta laid the initial foundation for the United States Constitution. Despite eight centuries of a battered “rule of law,” the Magna Carta provided foundational inspiration for our fundamental Declaration of Independence and United States Constitution. It deserves our honor and respect. “They were not looking for independence. They were looking for the rights of Englishmen to which they thought they were entitled.” Over 150 U. S. Supreme Court opinions have mentioned the Magna Carta. As an aside, why aren’t schools teaching about this 800-year-old phenomenon? With the Magna Carta marking its 800th birthday, the Library of Congress is celebrating, with an exhibit featuring a Magna Carta borrowed from England, and a series of lectures and events. A recent event was an invitation-only discussion of Magna Carta by Chief Justice Roberts and Lord Igor Judge, a former chief justice of England and Wales. Celebrating the Magna Carta is fundamental to the “American way of life.” It is not based upon rhetoric. It is based upon the freedoms and liberties that you and I enjoy today in 2015 – 800 years later. Rightfully so, this eight century tradition should be honored where honor is due. However, each English Monarch dutifully renewed the Great Charter. The formation of the United States Constitution in 1789 is rooted and grounded in the English Magna Carta. Early American colonists were deeply influenced by this document. It is still an extremely important symbol of freedom and liberty even today. It continues to be cited by politicians and campaigners. It continues to be held in the utmost respect by both English and American legal entities. In essence, the Magna Carta became “the law of the land” in the United States of America. Much of the United States Constitution is derived from the 1215 Magna Carta. This beloved document, despite revisions and modifications, continues to be honored in the United States as a precursor of the United States Constitution and Bill of Rights. At the beginning of World War II, Winston Churchill wanted to gift one of the four original copies of the Magna Carta to the American people, hoping that this would encourage the United States, then neutral, to enter the war against the Axis powers, but the plans were later dropped. That’s how important this document means to those who understand its relevance to freedoms we now enjoy. Beginning with the Magna Carta, the defense of individual freedom is everyone’s responsibility. Although to some it might sound archaic and even corny to some in the younger generation, every American should stand up and celebrate this historic event, the 800th anniversary of the Magna Carta. William J. Murray is the chairman of the Washington, DC based Religious Freedom Coalition. Robert Armstrong is a former board member of the Religious Freedom Coalition.